Dabang Mumbai avenged their bitter loss to Kalinga Lancers in their home game with a sensational 5-2 win here today that ensured they earned their top spot on the points table again. Kalinga Lancers are now pushed to the second spot. It was goals by Harmanpreet Singh (23'), Florian Fuchs (31') and Gurjant Singh (53') that fetched the visitors five points. The game between home team, Kalinga Lancers, and Dabang Mumbai was nothing short of a battle of supremacy as both teams vied to earn the top spot on the points table. 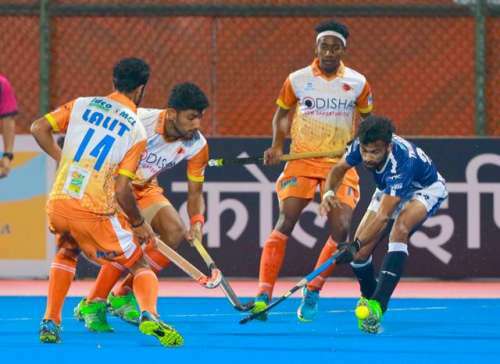 While Kalinga Lancers toppled Dabang Mumbai after their previous win against Jaypee Punjab Warriors, Dabang Mumbai were playing this game after two successive losses. The first quarter featured nail-biting action and high tempo as Dabang Mumbai ensured they kept dangerman Glenn Turner at bay, with at least three men marking him, making sure an entry into their circle was restricted. 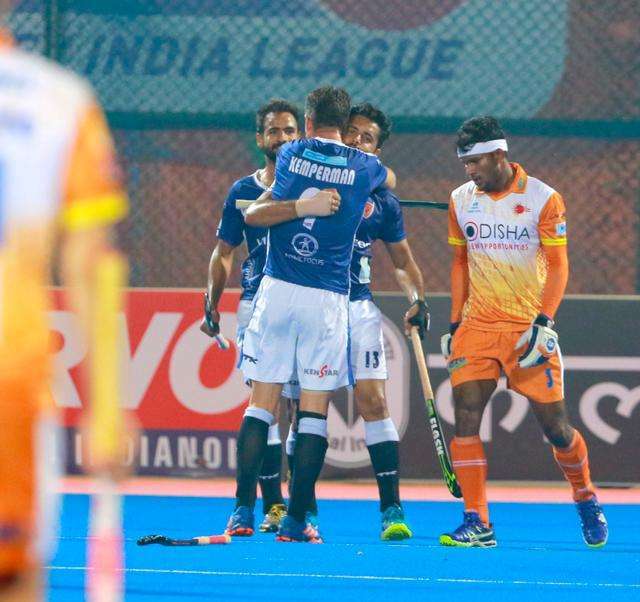 Dabang Mumbai did well in earning the game’s first PC in the 9th minute but was ably blocked away by Kalinga Lancers keeper Andrew Charter. The home team earned three back-to-back PCs too, after a series of fouls within the circle, but skipper Moritz Fuerste was slightly off the mark today and the two teams went into the first break in a stalemate. A great chance to take a 2-0 lead was lost by Kalinga Lancers in the 19th minute when midfielder Dharamvir Singh failed to convert after a brilliant assist by Glenn Turner. His tap was blocked by David Harte. However, Dabang Mumbai, unlike their opponents, ensured they didn’t let go of the chances earned when Harmanpreet Singh was inch-perfect when he successfully converted a PC in the 23rd minute to fetch his team a 1-0 lead over the home team. This was the in-form 21-year-old drag flicker’s seventh goal of the season. Skipper Florian Fuchs starred in the third quarter for Dabang Mumbai when he beat Kalinga Lancers’ defenders in the circle to earn a field goal only a minute into the second half taking their lead to a comfortable 3-0. The visitors kept up the pressure on Kalinga Lancers, dominating this quarter with the ball possession and they did well in defending the lead. Kalinga Lancers made desperate attempts to come back into the game in the last quarter, making forays into the circle but couldn’t quite make much of the chances. However, in the 51st minute, they earned their fourth PC of the game. But to the disappointment of the home crowd, they failed to convert it yet again this time trying a different variation attempting to score a field goal from the opportunity.